Computer based TV reception and RF interference studies are prerequisites to conducting productive on-site signal surveys, assisting the head-end engineer in the reduction of co-channel and adjacent channel interfer-ence, or eliminating the adjacent channel interference generated by the steadily growing number of Digital TV transmitters. There was a time when the CATV engineer's only weapon was studying aeronautical maps, the VHF and UHF transmitters marked on the map, determining the distances and directions of the transmit-ters with a measuring scale and protractor. It was a time consuming job and its accuracy a function of the engineer's interest in the project. It's time to move into the 21-st century with computer-based, fast and comprehensive data search programs, the results (literally) just a click away. A case-in-point is the computer-generated, computer-printed TV Reception Study, prepared for the Prince-ton, New Jersey antenna-site, turn to the next page, which presents essential technical and program parame-ters of all VHF and UHF stations within a 50 mile radius. Take note of the fifteen (15) Digital TV (DTV) stations in the New York-Philadelphia corridor, on-the-air, marked by X in the DTV column. The stations were listed in increasing distance order. By request, the listing can be changed to decreased field strength order, sorted by network affiliation, cities, states, call letters, or any other preferred format. But the best of all, the calculation and printing time is measured in minutes (occasionally seconds), and the electronic transfer of the information is instant, just a click away. Great circle distance calculations, exact to 1/100 mile. Azimuth angle directions, with a 0.1 degree accuracy. The effective radiated output power of the TV station. The transmit antenna height above average terrain. The frequency offset of the video carrier, which can be -10 kHz, 0 kHz or +10 kHz. A "must" information when searching for the dominant co-channel offender with the aid of the spectrum analyzer. The polarization of the transmission, which is horizontal (H) most of the time, but could be circular (C) or elliptical (E) polarization as well. The projected signal level in dBmV, assuming a 10 dB gain antenna at 30 ft above ground, flat terrain, average wave propagation conditions. To be verified by the on-site survey. The tremendous amount of tabulated data on the previous page may confuse even the most experienced en-gineer, distracting him/her from the essential technical information. Computer science provided the aid in the form of the Signal Direction Sheet. 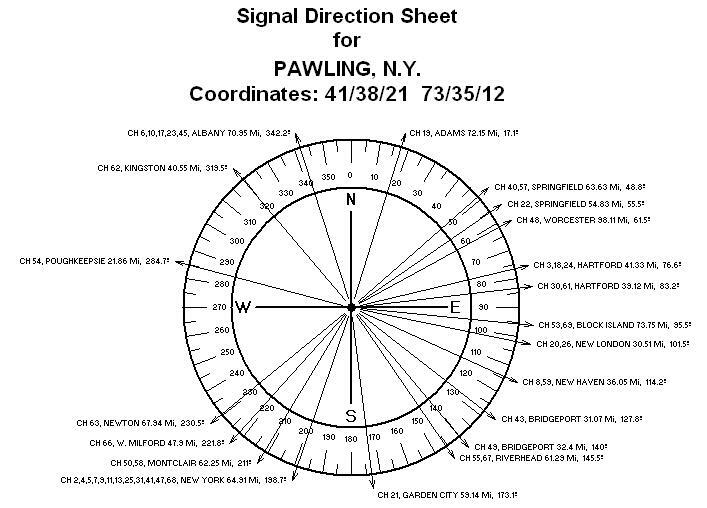 The computer-generated, com-puter-printed Signal Direction Sheet displays all VHF stations for the Pawling, NY antenna site, in a 50 mile radius. A glance at the sheet shows that the majority of the VHF antenna-arrays have to be mounted on the south-leg of the tower; a warning for the engineer in charge of tower-design. 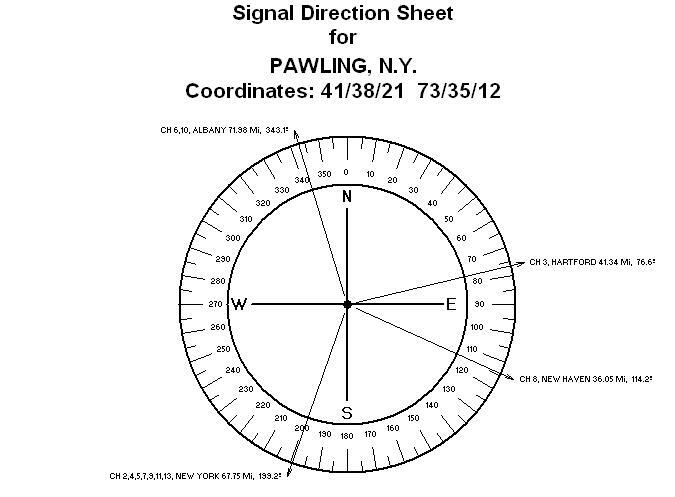 The Signal Direction Sheet, presented on the center of the first page, developed for the Pawling, NY antenna site, displays all UHF stations within 75 miles. The number of UHF stations more than doubled those dis-played on the VHF Signal Direction Sheet above. An interesting visual observation: not all Hartford, Bridgeport and Springfield UHF stations arrive from the same direction. To reach the same conclusion, it would have required a much longer scrutiny of the Computer Run's tabulated format.